Shahrzad - The Storyteller will amaze you at every level. Join Shahrzad, Alibaba and Sinbad along their journey to save the ancient world from a looming threat. 10 mysterious, eye-catching sceneries are waiting to be explored. Each level has 6 challenging puzzle games. 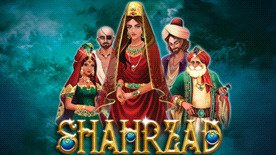 There is nothing like Shahrzad to prime your grey cells while you are enjoying the award-winning music of the game. Find the objects hidden within the cleverly crafted levels and enjoy a series of additional mini games, including pairing objects and finding differences, that will have your attention on its peak. Be agile, precise and gain enough combos to challenge your friends! And while collecting hidden treasures and trading wisely, you can use them to build your own palace! Shahrzad - The Storyteller is a stunningly beautiful hidden object game. Let the world of 1001 Arabian nights mystify you! Copyright © 2018 Libredia Entertainment GmbH, Austria. All Rights Reserved.